Ok here's the deal. 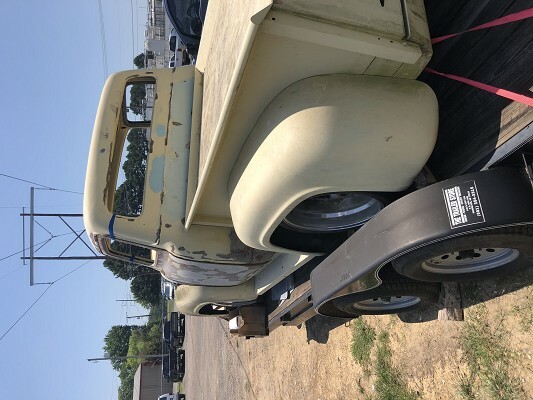 Bought this truck with all intentions of having a really nice 56 Ford. As you can see from the picture. This truck is done on the suspension and body work. All it needs is motor, transmission, Paint, interior, and glass. The frame has been rhino lined red, also on the rear of the frame has been C notched if your wanting to bag it. The rear of the truck has been welded up and with a smooth look. Has a bed cover that is welded in also. Fire wall has been replaced and is smooth. The dash has been smoothed also. The suspension consists of mustang 2 front end with 2 inch drop coil overs. Rear of the truck is 4 link with drop coil overs. It has a ford 9 inch rear end. This truck is on 20â€™s which are new with new tires. If you want more info or more pictures on the truck shoot me a text at this number 479-970-5668.